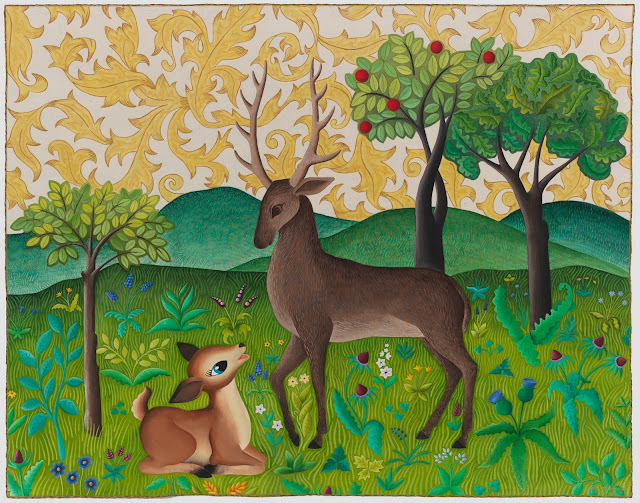 I just thought I would let you know, I created one long blog post about making my last quilt, Oh Deer, Look What's Become of Me! 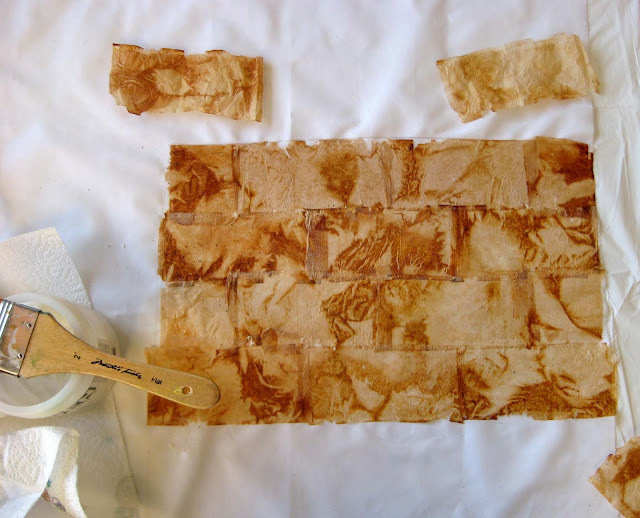 over on the Painted Threads Project blog so you can read about the making of it in chronological order. My sons a cover boy! 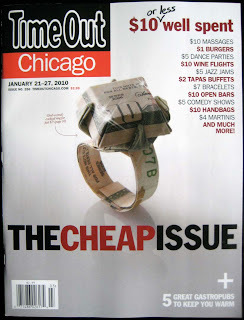 My son Ty has just made his first cover by designing an origami cocktail ring for TimeOut Chicago magazine. They even did a little feature of him on their blog. Even though I think the group in the photo technically are apostles of beauty, that title actually refers to an exhibit at the Art Institute called “Apostles of Beauty” Arts and Crafts from Britain to Chicago. Its a wonderful exhibit, the arts and crafts period has to be one of my favorites. A group of us from PAQA/SAQAILWI met this week for a field trip to see the exhibit and lunch. Trish Williams was with us as well but she had to head out before we took a group shot and Frieda Anderson was behind the camera. My friend Jamie Fingal, sent me these photos form Road to California this weekend showing my Deer quilt hanging in the Solid Expressions exhibit. I think it coordinates very nicely with the lovely traditional patchwork next to it. Fantastic Art Marketing Retreat with Alyson Stanfield! Artists: How would you like to sell more art? early March to help us get a groove on our marketing. probably grab it while you can. 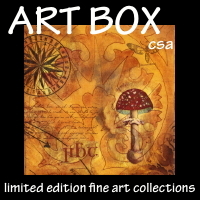 art out of the studio and in front of people who can see it and buy it. AND, you’re going to leave with an action plan. artists. We’re already at 2/3 capacity! The accommodations at the Siena Center are a down right bargain too, so this is an amazing opportunity to fit our tight recession budgets, too. Pre-order your copy now and have it by the end of the month! 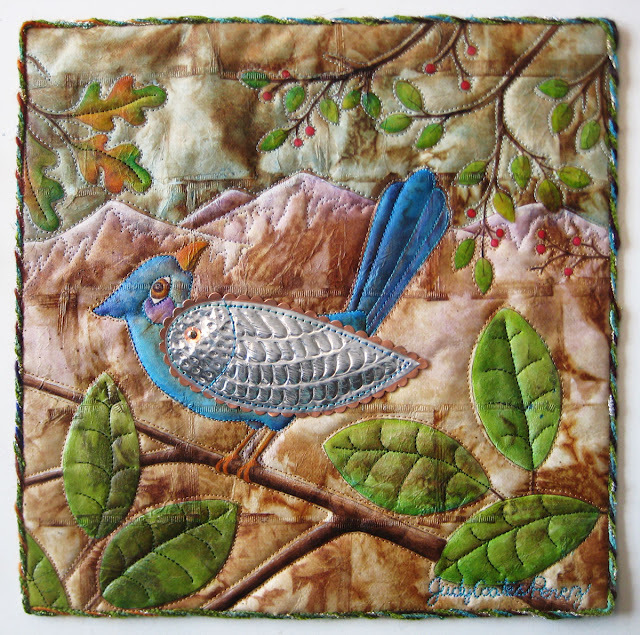 This is so exciting the new Lark book 500 Art Quilts is going to be released sooner than scheduled! It should be hitting store shelves by the end of January. A vibrant and growing community of crafters has embraced quilting, and this outstanding international collection will inspire and captivate them. 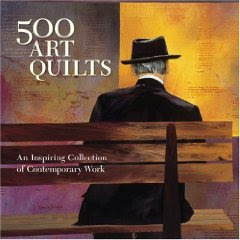 Juried by Karey Bresenhan, one of the most prominent figures in quilting, it presents 500 magnificent contemporary art quilts, made in fabric and other media, and showcasing diverse designs, materials, and techniques. From their very inception, these quilts were destined for display rather than practical use, with an extraordinary quality of image, form, line, and composition. Artists include:Pamela Allen - Alice Beasley - Eszter Bornemisza - Jane Burch Cochran - Judith Content - Chiaki Dosho - Noriko Endo - Caryl Bryer Fallert - Jamie Fingal - Linda Gass - Jenny Hearn - Judy Coates Perez - Yvonne Porcella - Susan Shie - Jen Swearington - and many more! at Road to California in the Robert Kaufman Fabric exhibit "Solid Expressions", these are all quilts using Kona Solid fabrics. This quilt is whole cloth painted on Kona "Ivory". I wish I could be there to see the other quilts in the exhibit too. Anyone who's going please leave me a note about the show I would love to hear all about it. 5 minutes of your time to have a chance to win some great stash! Visit Lesley Rileys blog for the details and link to her short survey. So you remember a couple weeks ago I mentioned the Lark Books Quilt it contest? 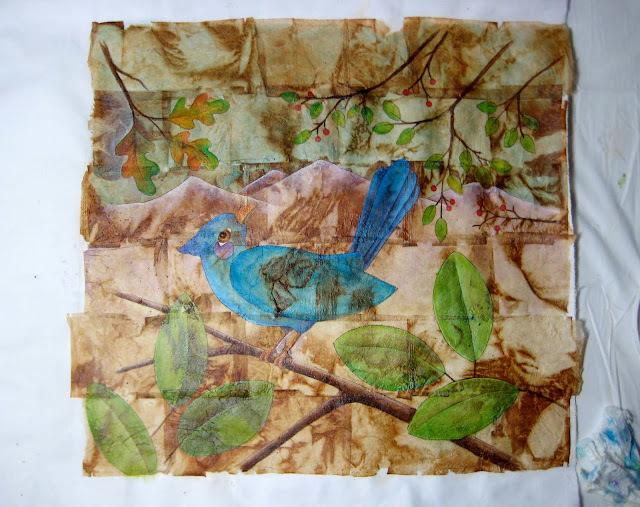 Take These Broken Wings 12" x 12"
It has a background of used tea bags gel mediumed to fabric. 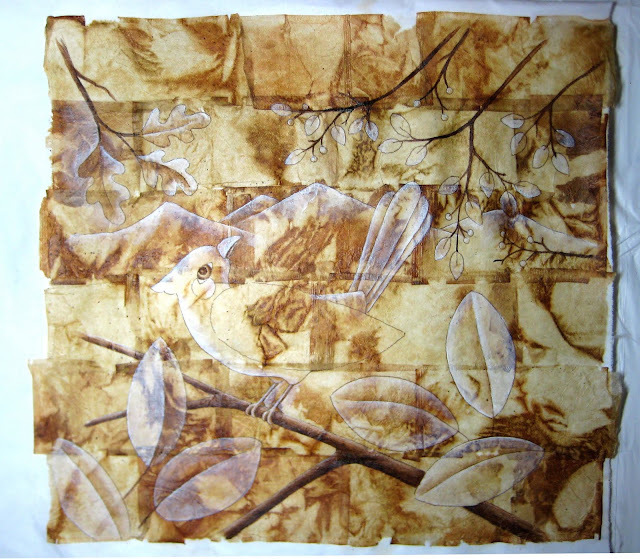 I drew my design on the teabag fabric and painted in highlights with white and the branches with brown before moving on to color. I painted the color with transparent washes of textile paint. 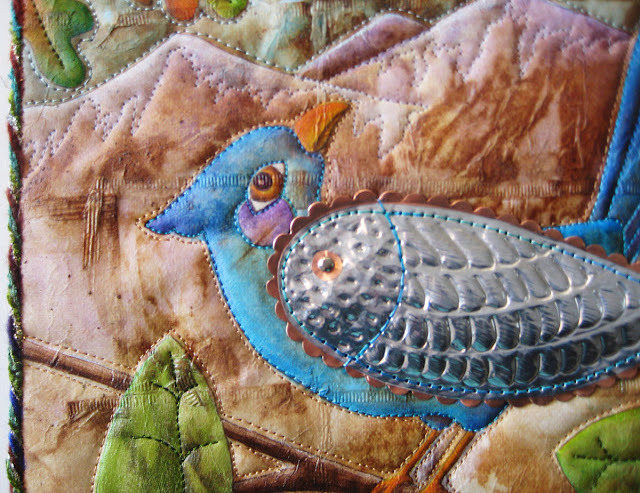 After quilting it with wool felt I sewed an embossed metal wing made from a sheet of aluminum layered over a piece of copper and a wing shaped piece of wool felt to give it more stability. A silver brad pierced through copper creates his shoulder joint.